Students gather in front of the Performing Art Center. Many wait for parents after school next to the PAC. 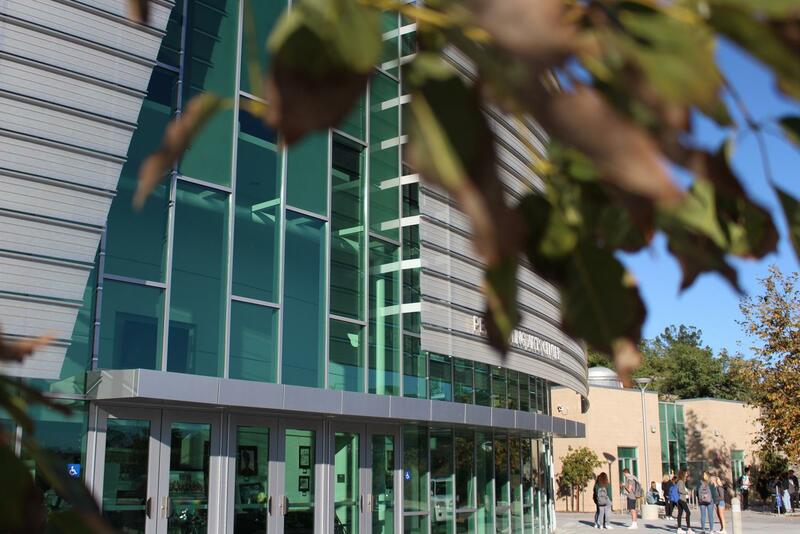 As the dark sage green curtain rises and the lights beam down on the students below, Sage Creek students begin their performance in their very own Performing Arts Center. The construction of the PAC was completed in June of 2018 after breaking ground on the project in 2016. Sage’s VAPA (Visual and Performing Arts) programs started the year with the opening Gala where all VAPA sections performed in one large joint production with the theme of Defying Gravity. Since their initial performance, the theatre program, in particular, has begun the transition of moving their program to the PAC. 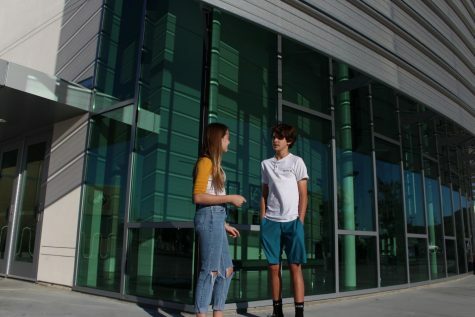 Freshmen Ava Loeffler and Joshua Lintner talk about their plans for the weekend next to the art that is displayed in the frontal part of the PAC. Student-made art made is often hung up inside the main entrance of the building. Hancock is excited to see how the PAC will develop over the years that he will be attending Sage Creek. Someone else who is excited about the addition is Art/Theatre teacher Jillian Porter-Eshelman. Even though the PAC was completed in time for programs to use it last school year, the theatre program is beginning to settle into the new expanse of Sage Creek. Porter-Eshelman stated that it is a “transitional year,” but is looking forward to using the structure throughout the year. This has been the goal for SCHS ever since the idea of the PAC came about. “It’s definitely going to ultimately be positive,” Porter-Eshelman said. Students and faculty involved in the VAPA programs are thrilled for the future of the PAC, “we are really grateful to have this opportunity,” Porter-Eshelman said with a smile on her face.